Tell me a day when you have not been to your kitchen! The kitchen is a space, which we use every day and hence needs a lot of maintenance. Kitchen furniture gets exposed to water, food stains, heat and what not! At the same time, it is required to maintain the cleanliness and hygiene of the kitchen. We need strong and durable materials that can withstand these problems as well as stand out aesthetically, so you enjoy and feel happy. For that, it is essential to know the pros & cons of PVC over wooden cabinets for your home kitchen. As there are many options available in materials for the Kitchen cabinets. Categorizing them in two, one as a base material and other as surface finishes. The base material is the one we use for making shutters and the drawers. There are many base materials available in the market such as PVC boards, ply boards, WPC, particle boards, etc. Surface finishes on such material can vary depending upon our selection like laminates, veneer, paint etc. 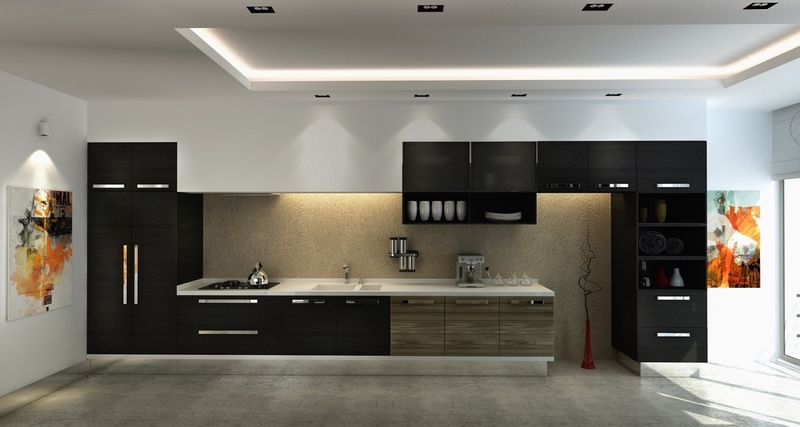 Wooden and PVC are the most common boards used for home kitchen cabinets. Let us know more about the two before constructing or undertaking any new or renovation work. Wooden cabinets are traditionally used materials for kitchen cabinets. Nowadays, they are often replaced by Plyboards or Plywood or Mdf boards as wooden cabinets are costly and warps when comes in contact with moisture. Plyboards and Plywood are usable for kitchen furniture if accompanied with best finishes. So it is important to cover them with laminates or film or paint them before you start using your kitchen. Since they are available in varrying range of strength, looks and cost they are majorly used in our country. Also, it has become a carpenter friendly material. MDF boards are generally not used in kitchen furniture because they bulge when comes in contact with water. But, every material has its own disadvantages too! If we talk about wood, it warps when comes in contact with moisture. It has low moisture resisting property so if the surface is not finished properly it will bend, warp and deteriorate at the end and will not survive its life! In India, housewives will have no satisfaction until they clean the furniture with the wet cloth. Cleaning with wrong chemicals or water can spoil the finishes of the wood. Such kitchen furniture cannot sustain against water exposure for a long time. To overcome this flaw, we have MR grade or BWR grade plywood for such spaces. But using such board can increase the cost of the project. Kitchen like space in our Indian homes is susceptible to termite infestation. And termite is drawn to wood. So using termite proof boards and anti-termite treatment is must to avoid any pest attack. Carelessness in any of this process leads to deterioration of kitchen furniture. Using laminates over plyboard can avoid water absorption and pest infestation.But, any laminate can get scratched easily. So, with time we need to upgrade and replace kitchen cabinets with a water-resistant and termite-proof material. Using plywood with laminate is always suitable for kitchen cabinets. However, before using it assure that the edges of the furniture is covered with a proper finish. These are hollow boards, available in 2400mm x 1200mm sizes and thickness 2 to 35 mm. These boards are used in packing, insulation, protection, cabinets, false ceiling and panelling depending on the thickness of boards. Cabinets are generally made up of 12mm and 18mm boards. Using hollow boards in kitchen cabinets is the cheapest solution nowadays. It is suggested to use such boards if you are planning for a short-term stay. PVC kitchen cabinets are quickly installed at the site. It is easy for a layman to work with (hollow board) PVC cabinets as they are light in weight. But they are not as sturdy as PVC foam boards kitchen storage cabinets. PVC kitchen cabinet – hollow boards are available in various bright colours. There is no need for finishing the surface. They are ready to fit kind of boards. PVC cabinet – hollow boards are available in various colours and finishes. These hollow boards are not prone to termite infestation. PVC cabinet hollow boards have low thermal resistance nor fire resistance. These are hollow boards, so long-term use can make the screws loose, resulting in sagging of shutters.Hence not so strong! Since they are hollow, they become home for small insects and thus creates unhygienic conditions. They get bend or sometimes break as they are quite light to take any physical hinderance. Fixing hardware in such boards are difficult as they deform on screwing. Such cabinets often sag and comes out of the place. PVC foam boards are very light in weight. So, it is easy to use such boards with fewer difficulties in transportation and handling. Like plyboards, it is easy to drill, saw, screw, bend, glue or nail it. One can also put a protective film on the surface of the boards. PVC foam boards are moisture-resistant. It has low water absorption property and hence it is easy to maintain hygiene. PVC foam boards are termite-proof and rot proof. 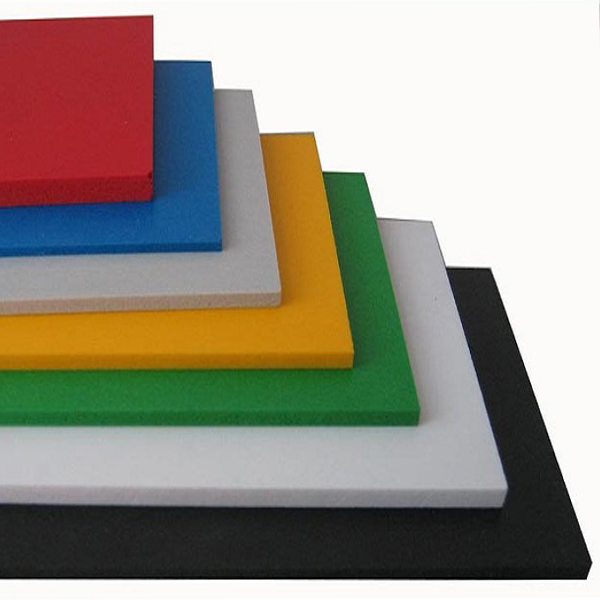 PVC foam boards are safe for kitchen cabinets as they are non-toxic and anti-chemical corrosion resistant material. PVC foam boards provide heat insulation and are fairly fire resistant. The best thing about PVC foam boards is that they are available in matt/glossy finishes that can be used directly for the kitchen storage cabinets. However, any raw surface can get scratches; hence we recommend using laminates or films for such surfaces. The only disadvantage of PVC cabinets is it needs skilled carpenter for fixing the furniture. Even improper screwing in the boards can cause sagging of shutters and drawers. PVC foam boards are giving a real competition to traditional wooden cabinets. It is time to replace old wooden cabinets with these PVC foam boards and have maintenance free cabinets. Hollow PVC kitchen cabinets and foam PVC cabinets provide you with the same look but different strength. Hollow PVC kitchen cabinets are cheap but PVC foam boards are as strong as wood kitchen cabinets. Thus, PVC kitchen made of foam boards are reliable and remarkable material for kitchen cabinets. However, everyone has its own taste to select a material but it is necessary to select your cabinet material wisely. Hope this pros & cons of PVC over wooden cabinets will help you to choose a right material for your kitchen storage cabinets. As the right choice of material will give you not only the good-looking kitchen but also a maintenance free kitchen!